The flowers are large silky pink with a red throat. Origin and Habitat: Northeastern Mexico (Chiuaua and coahuila) Like many cactus forms of this dry, hot region of Mexico, plants are strongly variable; therefore a precise description is impossible. 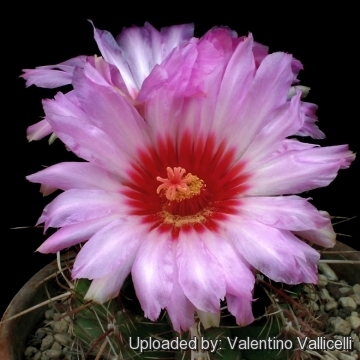 Description: Usually solitary the Thelocactus bicolor var. 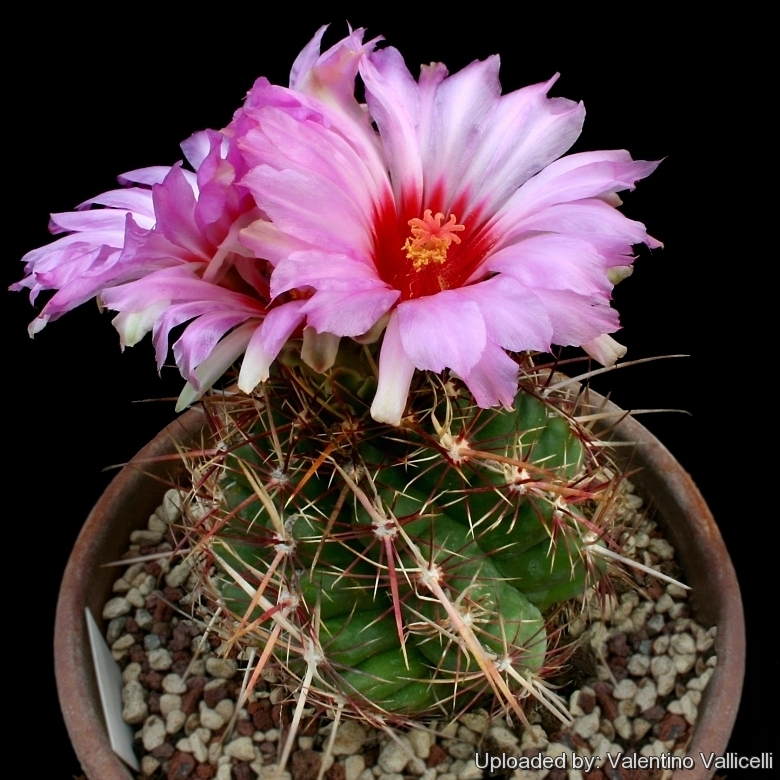 pottsii is one of most beautiful Thelocactus. Unfortunately this plant is supplied only, rarely, sometimes by the name Thelocactus heterochromus. Stem: Large, globular, low-growing, green, reach hardly 15 cm in diameter and get 10-15 cm tall. Epidermis - bluish-sulphur- green that became almost red-brown during the winter rest when the plants are dry. Tubercles: Rounded that form 8-11 (usually 9) distinct ribs. Areoles: Round, on the outer side of tubercle bear semicircular heavy cut. Spines: 7-11 (-19), powerful, very different in length, thickness and colour. Central spines: 1-2 (or more) bent back and newly bent to the body the upper one is flattened, red- white colored, the spines produced in spring are brighter and redder while the one produced the hot period of year are paler, some plants have very short spines, whose central prickle has a length of only of 1,5 cm, but there are plants with 5,5 cm long spines. The name "heterochromus" (= many-colored) indicates patch effect of prickles, but it can be also applied to the variable colours of spines in different plants. Radial spines: 9-11 (-18) 1,5-3 cm long, yellowish strong, awl-shaped, usually bent downward. Flowers: Imposing 8-10 cm in diameter pink-violet lobes with a dark red throat and yellowish orange anthers. Blooming season: Flowers appear exclusively from June through August.